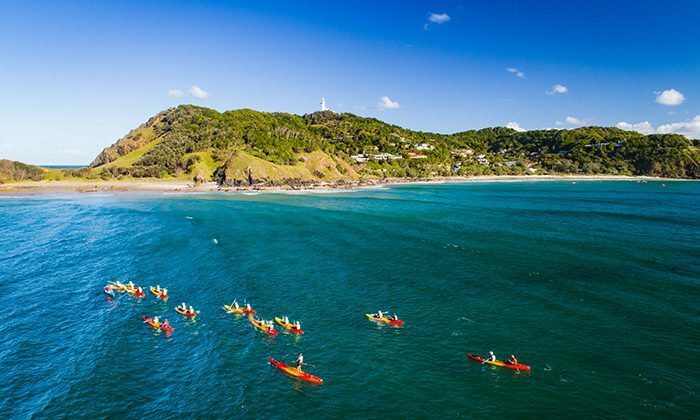 Before Byron Bay became Australia’s hotspot for surfing, yoga, beach life, celebrities and backpacking, it was and remains a gorgeous turquoise-coloured inlet with a resident pod of dolphins and migrating humpback whales. 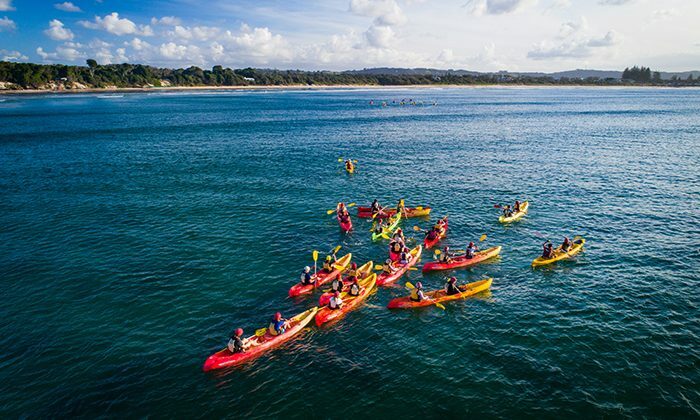 Dip your toes into those “soothing Byron salts” as you paddle out to greet marine life in a three-person sea kayak, guided by local characters to help you experience Byron’s nature at its finest. Kayak on the crests of waves back to the shore. 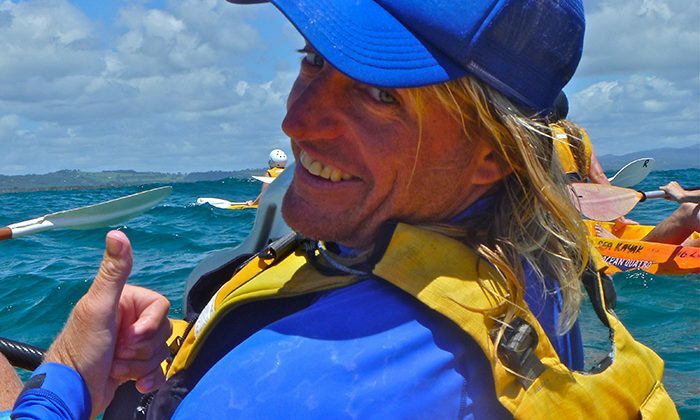 You’ll never forget the first time you surfed on a sea kayak in Byron Bay. Length of Trip : 3 hours, with about 2.5 hours on the water. Click here for the latest tour prices and booking. Best time to go : Tours run all year round. September to November has comfortable temperatures with the lowest average rainfall in Byron Bay. Wheelchair friendly : Not really, but call ahead if arrangements can be made. Family friendly : Yes. children over the age of 5 are welcome. Some of the kayaks can sit a child between 2 adults. In Byron Bay, consider Three Blue Ducks, Beach Byron Bay for the views, and vegan-fine-dining at The Beet. In Byron Bay, we recommend the family-friendly Discovery Holiday Park. You can also visit Byron Bay Accom for other options. Tours leave at the Go Sea Kayak kiosk located in the park opposite 56 Lawson Street in Byron Bay. 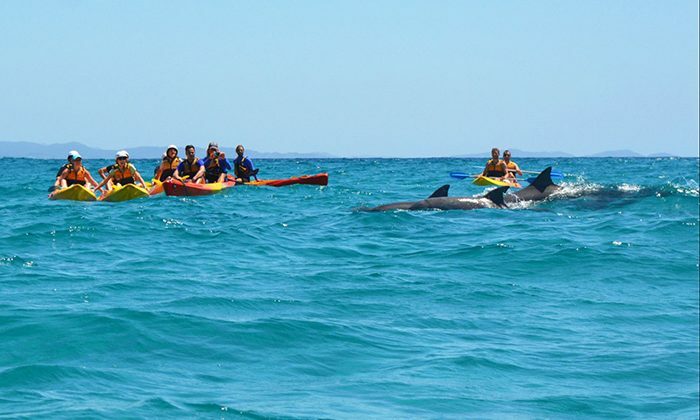 Byron Bay is home to a residential group of bottlenose dolphins which is estimated to have 100 dolphins in population.It's rare to not see dolphins during your sea kayak tour. So rare in fact that Go Sea Kayak will give you another trip for free if you miss them. Whale watching season begins in early June and continues right through to early November each year. Don't miss the opportunity to paddle out among the migrating humpbacks. 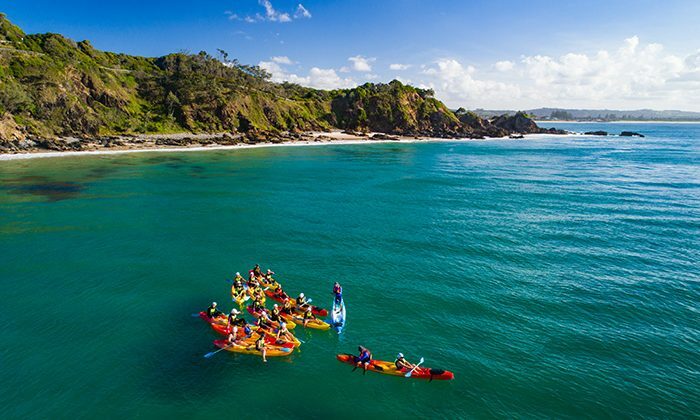 Does sea kayaking in Byron Bay belong on The Great Australian Bucket List? | © 2019 Esrocking the World Media Inc.